The botanical wisdom accumulated by indigenous peoples throughout the world has led to discoveries of new pharmaceuticals, chemical compounds, and a myriad of other products. Using riveting stories of fieldwork in remote villages, two of the world's leading ethnobotanists show how plants have affected nearly every aspect of our lives, deeply influencing the trajectory of human civilization. "An exciting book, clearly written and well illustrated. It impresses on readers the value of plants in their lives and cultures and the critical need to conserve plant biodiversity for future generations." "Thorough in scope, elegant in execution, far-reaching in its implications for conservation, this is a book that students and teachers of ethnobotany, as well as others interested in the wondrous world of plants, have been waiting for." "An excellent and thorough review of the field." 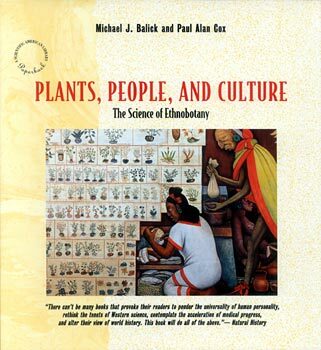 "Two of the world's leading ethnobotanists have teamed up to produce a most important book to explain ethnobotany, the science of people and plants." "In this beautifully illustrated book, Balick and Cox have done an excellent job of presenting, in language acecssible to the general public, their theme of plant biodiversity, and the knowledge that is gained through a study of ethnobotany."